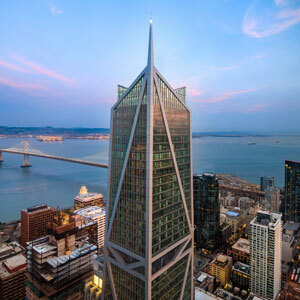 The mixed-use program of the 181 Fremont building required different systems to be used for the residential and commercial areas. The office floors feature a dedicated outdoor delivery system on every floor, supplying air to fan-powered terminal units that provide preconditioned and dehumidified air at each zone. The outdoor air delivery system contains a high-temperature chilled water coil that precools the outdoor air in the summer, and a secondary DX coil that provides additional cooling and dehumidification. This system eliminates the need to overcool and reheat supply air during part-load cooling conditions, as is typical of a central variable-air volume (VAV) system, making it much more efficient. Meanwhile, residential units are conditioned and ventilated by four-pipe fan coil units that have direct access to fresh air intake through the façade of each condominium. Additional energy savings are achieved because of the reduced need for fans, since only ventilation air is distributed throughout the building. The chilled water plant consists of three premium variable-speed water-cooled centrifugal chillers, two cooling towers with variable speed fans, and two waterside economizers that provide free cooling to office and residential chilled water loops when the outdoor conditions allow. Additionally, a natural gas-fueled combined heat and power (CHP) microturbine, sized for 65kW electric or 118 kW heat generation capacity, provides electricity for the building electrical base loads and heating to meet the hot water demand for the residential units.